REVIEWED: Spider-Man statue by Diamond Select Toys | 'TAIN'T THE MEAT… IT'S THE HUMANITY! Over the last couple of years Diamond Select Toys have released an impressive range of attractive — and affordable — PVC statues featuring some of Marvel Comics’ most popular super-heroes. And this statue of The Amazing Spider-Man is no exception. To date Diamond Select’s Marvel Gallery PVC Diorama series features over 80 full colour statues averaging approximately 12 inches in height, and the collection continues to grow. I’ve already looked at three other statues from the collection – Iron Man, Doctor Strange and The Incredible Hulk – and the quality of all three has been uniformly impressive. Not only are they high quality statues but each artfully plays to the strengths of the individual character, with all three being both dramatic and action packed. It’ll come as little surprise then that Spider-Man follows in the same mould with just one exception: this statue is easily the most graceful of the bunch. The statue measures an impressive 12 inches in height (when the base is included), and ships in a cardboard display box with transparent windows on the front and sides. 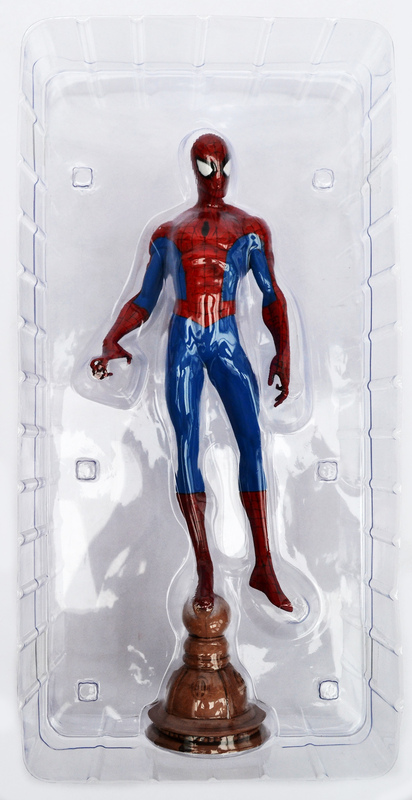 The back of the box features a short biography of the wall-crawler, and inside the statue is encased in two pieces of studded blister packaging, which was more than up to the task of protecting the statue. The statue ships between two pieces of blister packaging. This Spider-Man statue depicts the iconic character balancing on one foot on top of a building, and the piece is both elegant and graceful, with an almost balletic quality. The sculpture, by Mat Brouillard (who also designed the Iron Man statue), is terrific; the level of detail is breathtaking and the detailing of Spidey‘s muscles are some of the best I’ve seen on any statue. Brouillard has correctly given Spider-Man an athletic, almost wiry build instead of the usual heavy musculature that is de rigueur for almost all Marvel super-heroes. I also really like Spidey‘s stance: calm, yet alert and ready for action. He looks down as if something on the street has just caught his attention, his right hand flexing as if he’s about to jump from his pedestal and swing into action. Most statues I’ve seen of the character tend to depict him sticking to a wall, or lunging toward the viewer but there’s a wonderful sense of grace and elegance to this statue that immediately commands the viewer’s attention. I have over 50 statues in my modest collection but this is the first I have of the iconic Marvel character… and it was well worth the wait. As excellent as the statue is though it’s not without its problems (minor though they are). As I mentioned in my review of The Incredible Hulk statue the seams between body parts was quite noticeable, and the same goes for this piece. The seam at Spider-Man’s waist and shins are clearly visible, as are the ones where his biceps meet his shoulders (although to a lesser degree). However, on the plus side, there aren’t any signs of glue like there was on the Hulk piece. 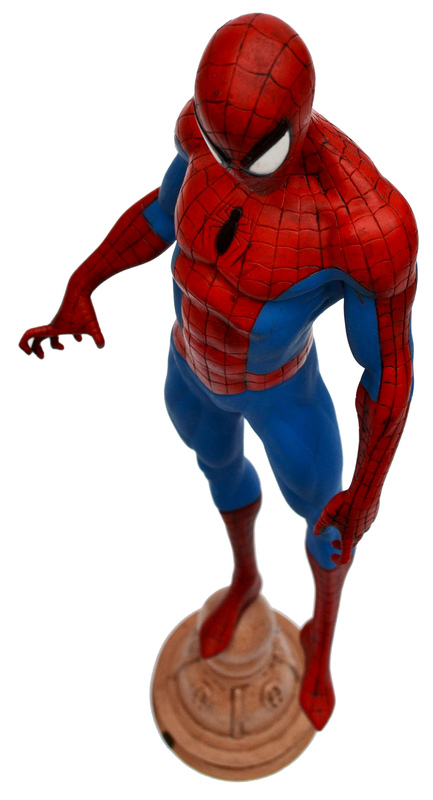 Also the paint work for this statue is a bit loose in a couple of places: the black around Spidey’s eyes overlaps onto this mask, and some of the red of his costume bleeds into the blue. These are understandable though, especially considering the statue’s price (more on this later). Less forgivable though is the large splodge of paint at the base of the statue, which counts as a definite black mark against the piece (pun intended). The black splodge of paint on the base is sadly quite noticeable. However my quibbles with the paintwork don’t really distract from the statue’s overall effect, and on the whole the paint job is effective and well done. There is some nice colour shading on the red part of Spidey‘s uniform, and the thin black lines of the webbing are neat and accurate. The musculature of Spidey’s shoulders and back is very well done. There is one more thing I should point out, although this isn’t strictly speaking a problem: the statue is very light and delicate. The Incredible Hulk statue weighs over 1½ kilos, and has a satisfying heft to it. This Spider-Man statue weighs 211 grams and feels quite fragile; I’m a little concerned that his fingers may break if the piece is mishandled — I’ll definitely need to be careful when dusting this statue. The colour shading on the red parts of Spider-Mans costume is very well done. In line with the other statues in Diamond Select’s Marvel Gallery PVC Diorama range, this Spider-Man statue retails for $45 (around £40), but hunt around and you should be able to find it cheaper — I found mine for £35. Diamond are clearly aiming these statues at the affordable end of the collectors market but that doesn’t mean they look cheap. Using PVC is an obvious way to keep down costs but the statues are still of a very high standard. I have smaller, less impressive statues in my collection that cost a heck of a lot more than these pieces from Diamond Select. The Amazing Spider-Man statue, from all sides. 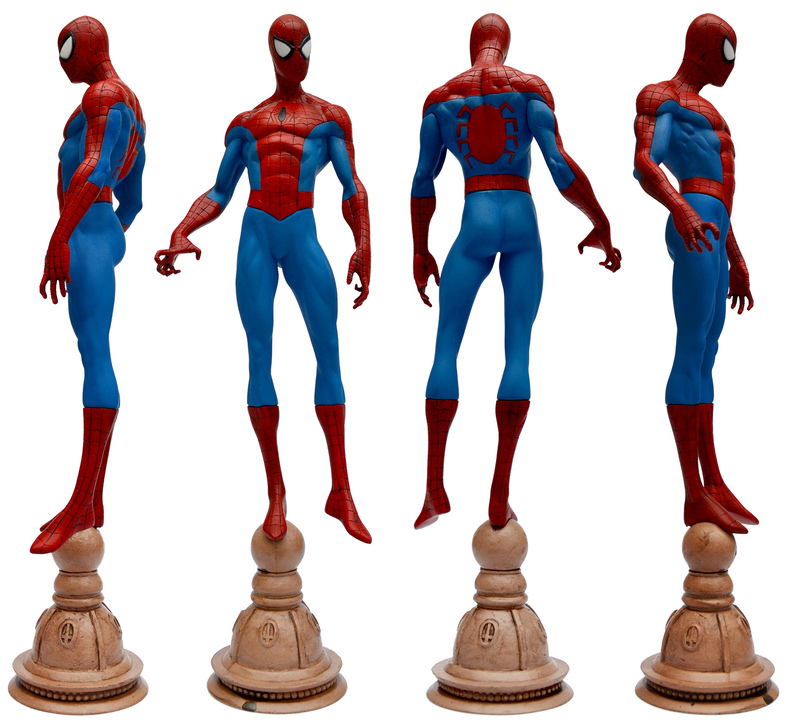 Diamond Select have released two versions of this Spider–Man statue: the ‘classic’ red and blue version shown here, and a limited black-and-white alien symbiote edition. I much prefer the red and blue Spider-Man, mainly because I’m an old school comic book fan, and also because I never really liked the mean-and-moody black and white version. All told this Spider-Man statue is a welcome addition to Diamond Select’s growing range of PVC diorama statues, as well as a welcome addition to my collection. The gracefulness of the piece — that feeling that we’re witnessing a meditative moment in Spidey’s day just before he leaps into action — is very effective, and helps make this an undeniably eye-catching piece. And at under £40 the statue is a genuine bargain. Both serious collectors and casual Spider-Man fans will find a great deal to enjoy with this elegant statue.